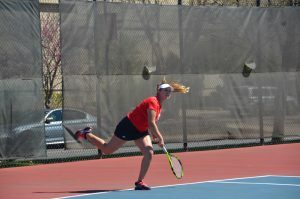 The Braves defied all odds Friday night by overcoming a 15-point deficit in the final two and a half minutes. 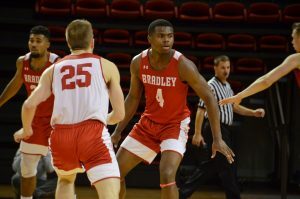 Bradley (6-4) outscored sixth place Indiana State, 21-3, in the last 4:08 at Renaissance Coliseum Friday night to complete a come from behind 81-80 victory. In a game where the Braves struggled to contain its visitors, they came out on top thanks to freshman Lasha Petree’s 14 points in the final 2:27 of the contest. Petree finished with 18 points on the game with three steals in 18 minutes of action off the bench. All three steals came within a 41-second span in the fourth quarter. Sophomore Gabi Haack led all scorers with 20 points. She was proud of her freshman teammate for persevering and leading her team to victory after luck didn’t go her way for the first three quarters. On the other hand, Gorski said it was the poorest defensive effort this season until the last couple minutes. Bradley, tied with the Sycamores at 39 apiece at halftime, had nine turnovers and struggled to beat Indiana State’s full court press. The Sycamores outscored Bradley 31-15 in the third quarter, but the Braves battled back, totaled 27 in the final quarter against Indiana State’s 10. Sycamores forward Ty Battle hit a jumper to tie the game at 80 with 8.4 seconds remaining. Petree soon took the final lead with seven seconds at the free-throw line and junior Chelsea Brackman blocked the final shot as the arena erupted in cheers while the team rushed the court to celebrate. In the post-game press conference, Gorski said she thought the “ferocious comeback” was a dream. 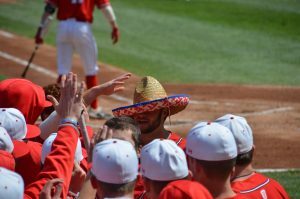 Bradley will host a winless Evansville at 2 p.m. Sunday in Peoria and looks to solidify a spot in the top half of the conference.